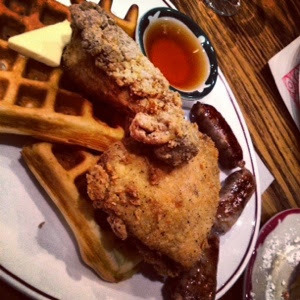 Fried chicken and waffles has been popular for a while now and all I kept hearing was Nouveau Palais does it up right. On a random Sunday, my best friend called me and asked if I wanted to tag along to brunch at Nouveau Palais, I immediately accepted the invitation knowing this was my chance to see what the buzz was about. We arrived and we were seated immediately, thank goodness as I was starving, and ordered drinks. 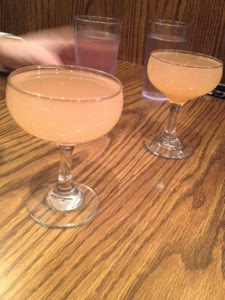 Two of us had the fresh squeezed grapefruit mimosa, while the other had a bloody Caesar. 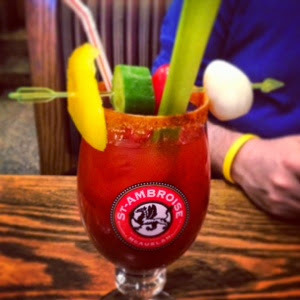 The loaded Caesar is served in a beer glass with a Cajun spiced rim, a skewer of bell pepper, cucumber, cherry tomato, a quail egg and of course a stalk of celery. The mimosa was tart and refreshing while the Caesar was spicy and comforting. I really enjoyed both. We saw beignets on the menu and immediately knew we had to have them. 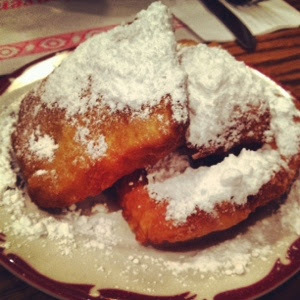 Served three to an order and dusted with powdered sugar, these devilish treats were really good. Crispy on the outside with soft and chewy center, these fried treats were delicious and thankfully not overly greasy. Then I spotted my fried chicken and waffles. A more than generous portion of waffles and chicken, enough for two people, was served to me and I dug right in. I enjoyed the chicken and thought it to be very juicy, yet for some reason I imagined it would be better. The flavour was delicious and well balanced, however I thought the crispy crust could have been more evident and crispier. I also thought the chicken was a touch on the greasy side and should have been better cooked. The waffles on the other hand were just perfect. Crispy exterior and soft interior – delicious! Placing the chicken, waffles and syrup all together, I knew immediately why this dish was so popular. Separately each element was good but put together they create an amazing treat. Of course my eyes are always bigger than my stomach, so before I knew it I had also ordered the sausages as a side – Food coma! These little links were absolutely perfect and I was more than thrilled to over stuff my belly to finish every last bite. Pan seared with a crispy exterior and a deliciously spiced tender interior, these sausages were just delicious and I enjoyed each bite. 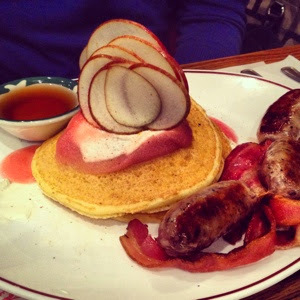 My friend ordered and enjoyed the apple pancakes; a fluffy stack of pancakes separated by sour cream and topped with thin slices of apples and apple compote. I tried this dish and for someone who loves sour cream and pancakes, I was not a fan. The pancakes on their own were fluffy and flavourful, but not the kind of pancakes you serve with sour cream. At least that was my opinion. My other fried enjoyed her dish but for some reason I don’t remember what she had nor did I take any pictures of it, not sure why. We enjoyed our brunch at Nouveau Palais and will be back for more. It is a great casual spot with good fresh food and a great friendly vibe. The perfect place to nurse a hangover Sunday morning; not only because of the food, but the alcohol too!